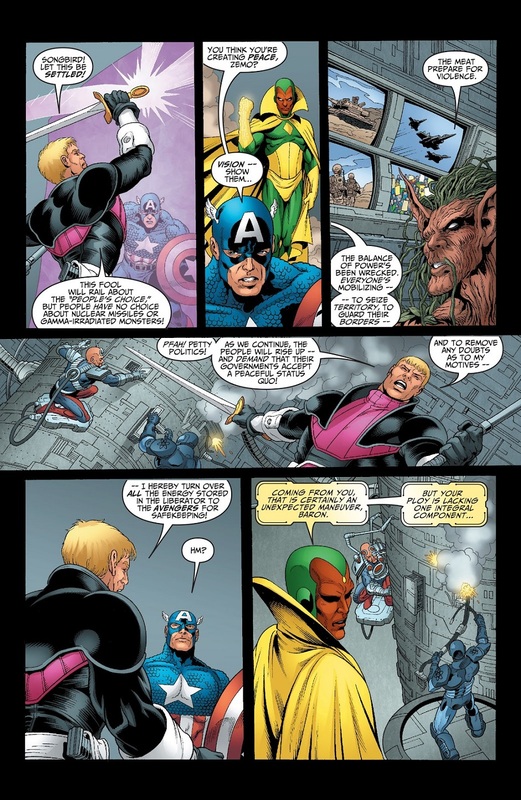 So, at this point were the Avengers convinced that the Thunderbolts were still the Masters of Evil and Hawkeye was turned by them? 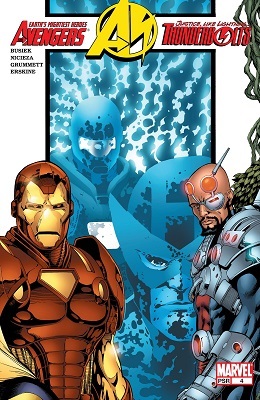 But it was kinda a give-away considering the armor had the triangle plate the MK13 and Extremis armors would be famous for. "She introduced alien software into an experimental machine! Who KNOWS what it might have done"
I wonder if Tony is supposed to sound angry, or jealous when he says that, because frankly, either works. "She's endangering countless lives with a thoughtless and almost certainly selfish and self-serving decision... and that's MY job, dammit!" 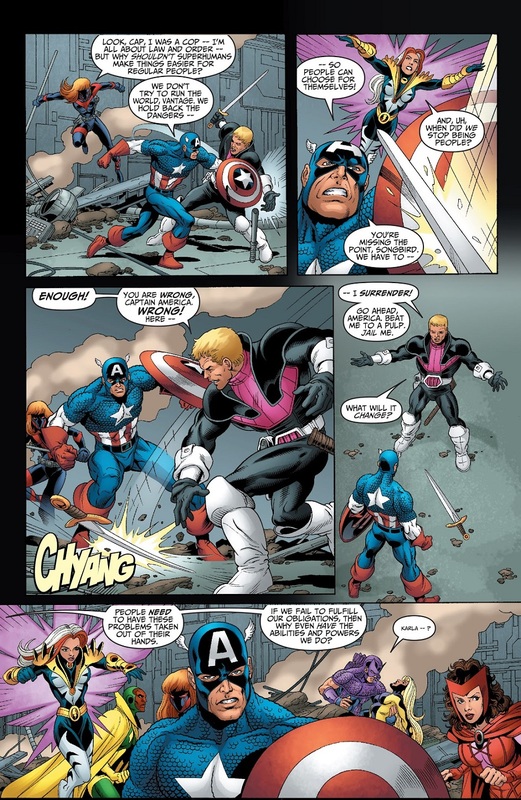 Its funny how many times Cap is arguably the bad guy in crossovers like this, Civil War*, and AvX. *Well the movie anyway. 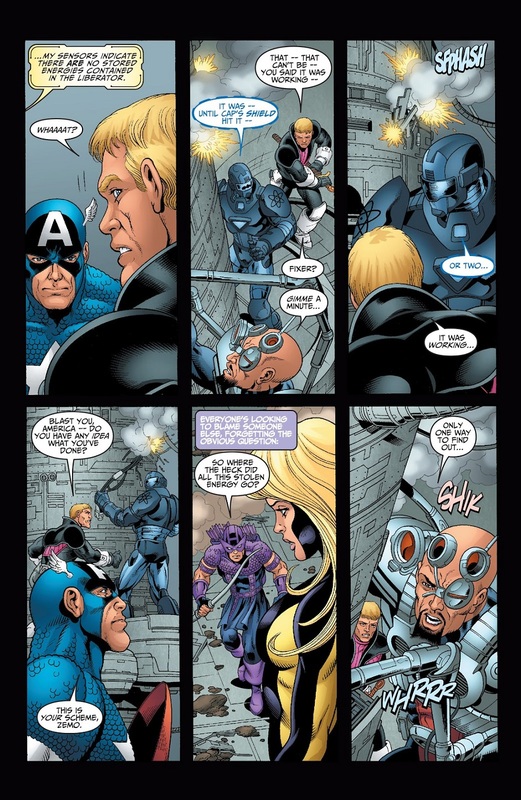 Tony is clearly the villain in the comic. 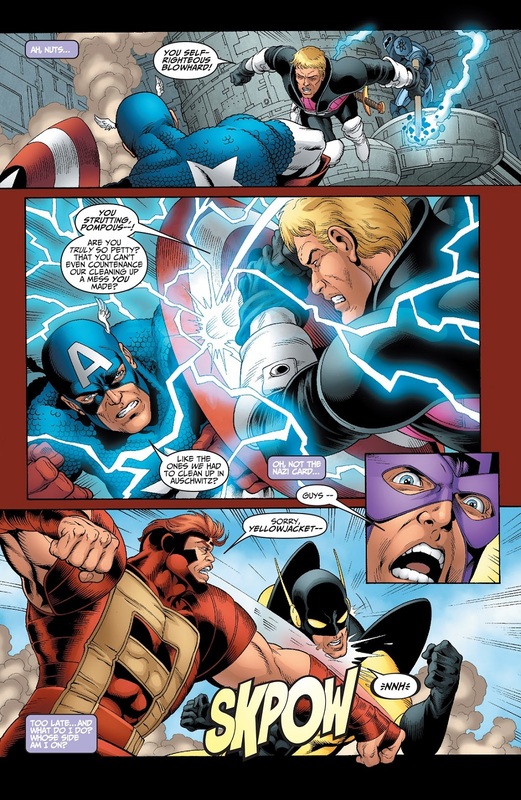 I've posted this, but in the comics CIVIL WAR Steve wasn't offering an alternative to the Registration Act. He also was alternating between "I want to protect other superheroes who want to keep secret identities." and "I am doing what is best for the American people because Tony and Reed want to start a plutocracy." Both sides were kind of a mess in the comics. I never really understood why so many of the more popular (in universe) Anti Reg people became fugitives instead of speaking* out against it. Oh right, it was because even inactive heroes were being rounded up and sent without trial to a secret prison in a dimension that sometimes drives people mad. Team Cap may have been reactionary idiots in the comic but the leadership of team IM were oughtright evil. 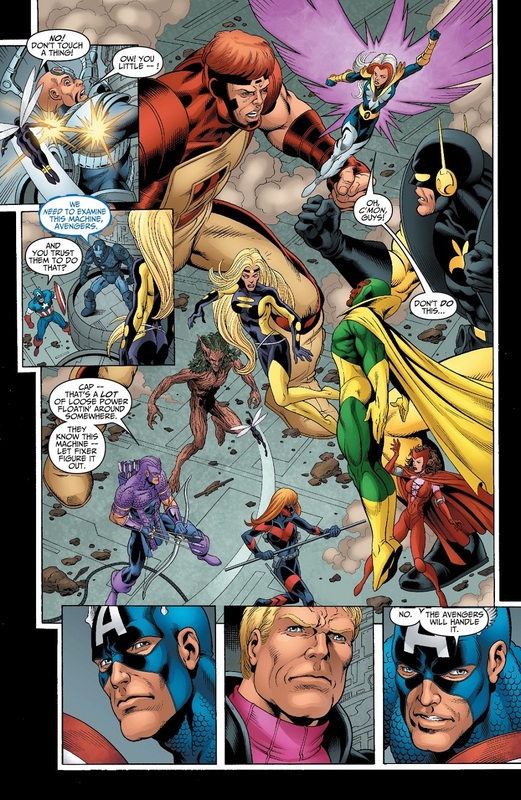 Heh, somehow Tony is the most awful person in a discussion that involves both Moonstone and a Zemo. *We saw She-Hulk on talk shows in favor of the act (though her solo book showed she was fairly reluctant). 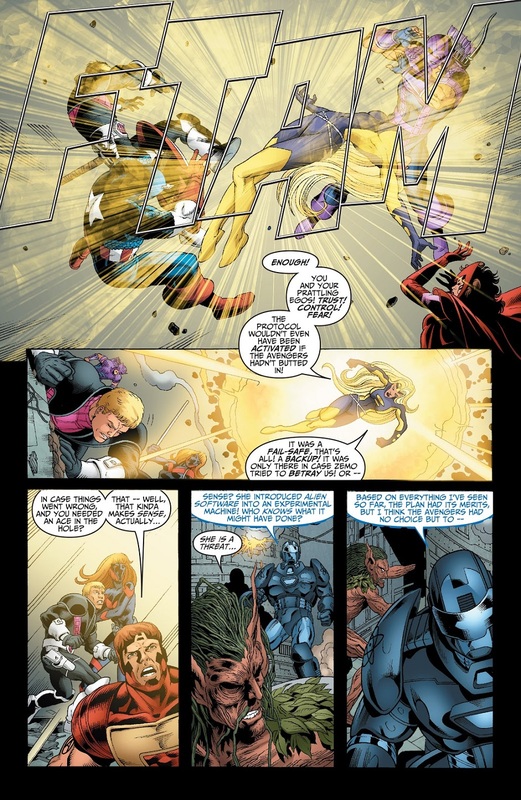 Why not have another superpowered talking head to counter her? That seems like a more likely action for a guy like the Thing than running away to France like a coward.